The Watagans Natiaion Park is a stretch of the Great Dividing Range, south of Cessnock, West of Lake Macquarie. It's about 77 km² and is a great place to go out exploring. We decided to take Evelyn and Charlotte on another outing looking through the bush while still in the Hunter and what better place than the Watagans! The drive out from Cessnock is beautiful and scenic, the track was a bit rough from all the rain this season, however being in the troopy we had no worries! Our first stop was at Hunter Lookout to stretch our legs and have a look at the beautiful view! While having a look around we were lucky enough to hear a Yellow Tailed Black Cockatoo having a squawk up in the canopy. After enjoying the views we set off for the Boarding House Dam area. This was a stella choice for the day due to the fact back in town it was about 40 degrees, but up in the mountains under the canopy the air was much, much cooler. The designated walk by the dam is quite an easy walk, as soon as we begun we were enthralled by the enchanted feel of the place. Huge tree's which had fallen down and now covered with moss and large boulders covered in green make this bit of bush feel more like a magical forest! After we reached then midpoint of the walk and with the girls leading the charge, we ended up slightly off the beaten track! We then commenced "climbing rocks" following the rivers path. This made for a great fun bit of exploring! After several hours of climbing rocks and searching for interesting things, we made our way back to the designated path and made our way back to the dam for lunch. After lunch a swim was in order. This was a great idea, except for the fact we were in the mountains and had just had a heap of rain... It was cold so cold we couldn't feel our toes! 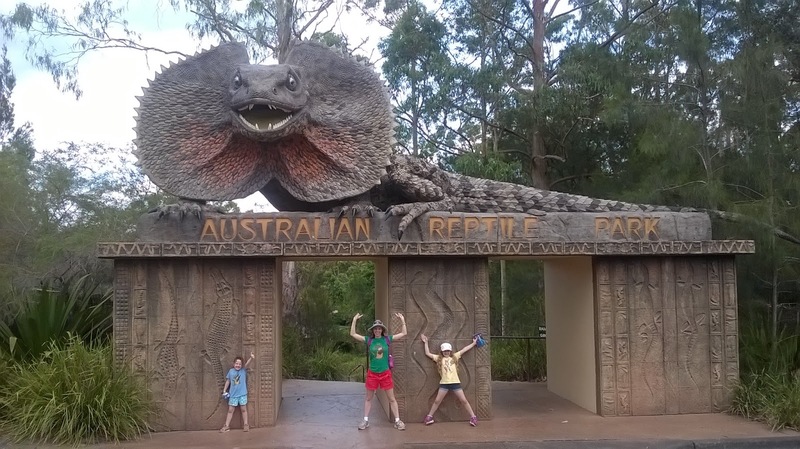 The Australian Reptile Park is in Gosford, not far north out of Sydney and is a great place to spend the day with the kids. Yep you heard me right, I said kids! I'm sure most of you realise Jen and I have no intentions of having kids any time soon. Although kids can be fun to take out and give back at the end of the day, introducing my god daughter and her sister, Evelyn and Charlotte. he did a tonne of work developing antivenom in the early days. 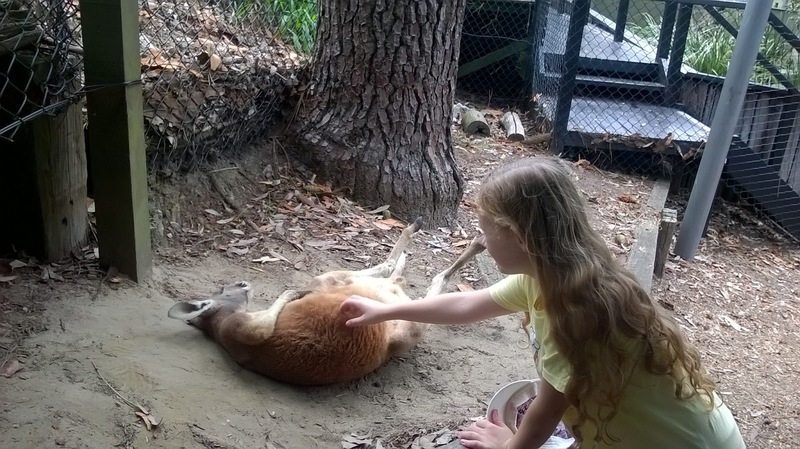 Today the park has a huge collection of American alligators, a big croc named Elvis, heaps of cuddly koala's, kangaroos, wallabies and of course a grand collection of reptiles! 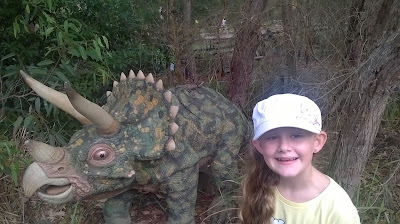 We were even lucky enough to spot a water dragon riding a triceratops. There is a great little play area for the li'l ones to kill time between feedings and shows. Which you will want to be sure and check out! The Galapagos Turtles are quite interesting to watch munch on their veggies and if you are lucky you may get a chance to give big Hugo a pat. 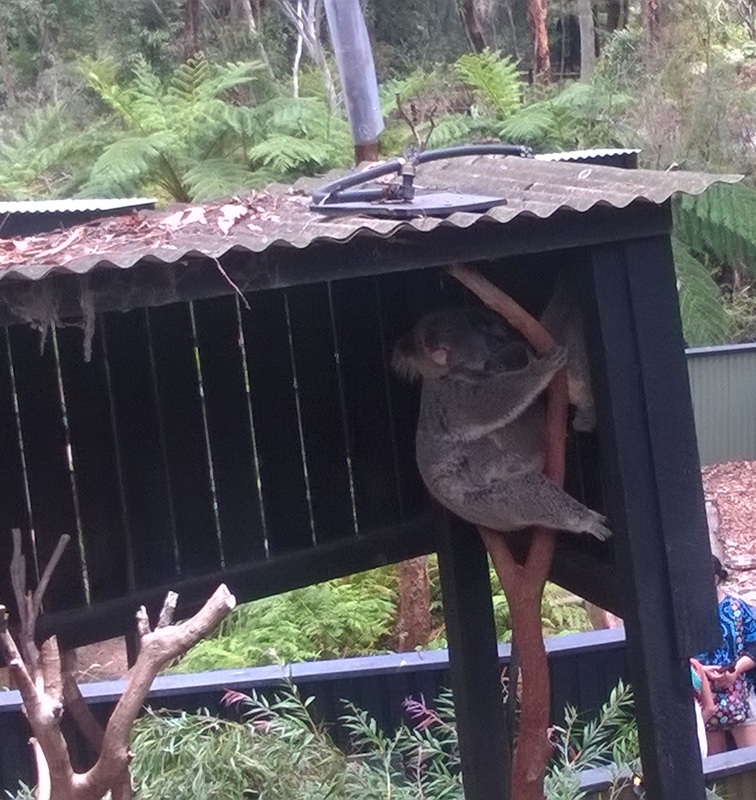 If giant turtles aren't your thing there's plenty of opportunity to pat koalas and skippies also. But the major reason to come here is to check out the grand collection of lizards and snakes. There is a beautiful selection of terrariums you can check out inside, but the reptile show is where it is at! The fella who ran the show was a true reptile enthusiast, his knowledge of reptiles was amazing and his passion for the critters really shone through. He'd throw some interesting facts at you whilst walking around allowing everyone to have a pat of the reptile. One lizard in particular I found really interesting was the Black and White Tegu. This beauty was one of four that live in Australia. Originally found in Argentina these guys get knocked off by farmers due to the fact they quite enjoy chomping down on chickens. A breeding plan is in action, however the other three that call Australia home are female and like to beat up the much larger male. Women! They had no croc feeding on this particular day, but that was ok as we had all seen crocs chomping several times beforehand. 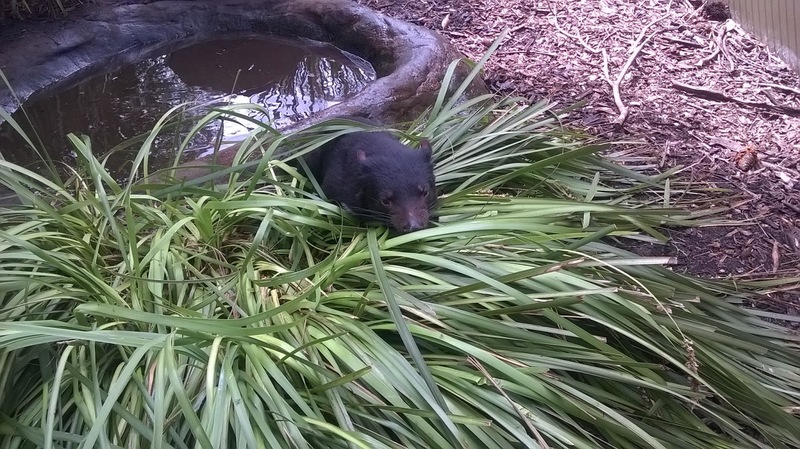 The Tasmanian Devil is a rather interesting critter from the south, a carnivorous marsupial with a population in decline. 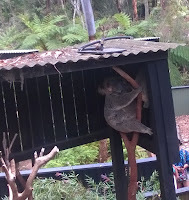 The Australian Reptile Park have a few of these li'l guys on display and if you time it right you can watch them feed. There is a contagious cancer which is killing them in the wild, however an initiative of the park is "Devil Ark". It's exactly as it sounds, they have a big property with a bunch of devils living in contained wild enclosures. If they do go extinct in the wild, the devils from the ark will be strategically released for repopulation. If you would like to read more about the issues facing the devils, Devil Ark or would like to donate, check out the Devil Ark page here. One thing I learnt on this particular day though was to never tell youngens we might go to the beach after an attraction or event. Reason being as soon as they get a bit hot and bothered they will end up with tunnel vision! That was alright though, we had a great romp around the park and the beach with the ocean baths was a great way to end the day! 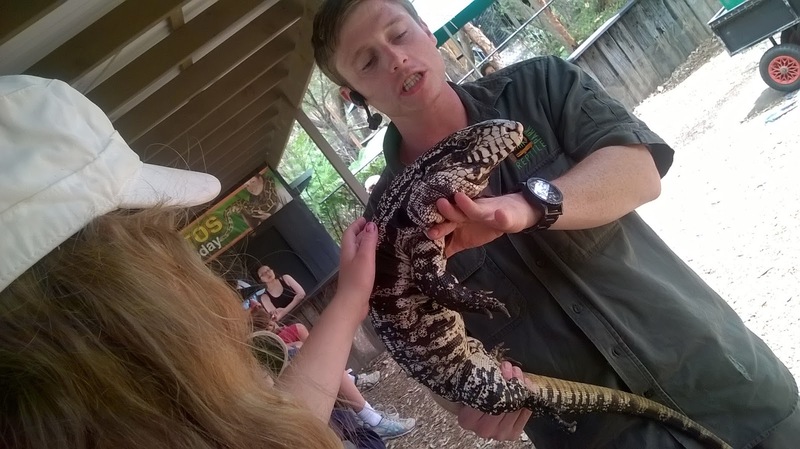 The Australian Reptile Park also have several behind the scenes tours you can do for a bit extra. On this particular trip we didn't get involved as Evelyn and Charlotte wanted the beach, but if you got a bit of extra cash and want to see some snake/spider milking and some extra reptiles it is definitely worth enquiring about.